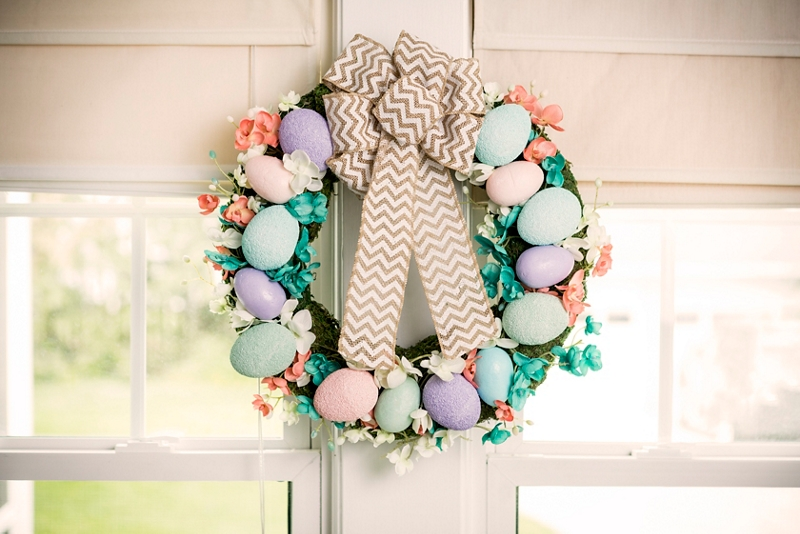 Impress guests with a spring colored Easter egg wreath made with Krylon! On a covered surface in a well-ventilated area, place the craft foam eggs on the rim of a paper cup to set up for spraying. If the eggs are too small to fit on the top rim of the cup, turn the cup upside and place them on the bottom rim of the cup. When spraying the eggs, place the cups on a Lazy Susan and turn while spraying for ease of application. Spray each egg with Krylon Craft Foam Primer. Once the eggs are dry to touch, flip upside down to spray the other side. Allow the eggs to cure for 48 hours before topcoating. Once the eggs have fully cured, use the same application technique to topcoat the eggs using Krylon ColorMaster Paint + Primer in Gloss Gum Drop, Satin Catalina Mist, Gloss Blue Ocean Breeze, and Satin Ballet Slipper. On a flat, covered surface, spray the wreath hook with Krylon Premium Metallic in Rose Gold. Allow all painted items to fully dry before assembling the wreath. Add moss to the top of the floral foam wreath using a hot glue gun. Attach the eggs to the wreath using toothpicks by sticking one end into the egg and one end into the wreath. For added support, use a hot glue gun. Add the flower stems into the empty spaces around the eggs. For added support, use a hot glue gun. With ribbon, make a bow and wrap bow around the top of the wreath. Hang wreath on an indoor door with a wreath hook!